Maison Fontainbleau - At Your Service! Maison Fontainbleau is stylishly chic, our decor is striking, with colourful original works of art, giving a welcome and comfortable ambience. A delicious breakfast, with an abundance of seasonal fresh fruit, may be enjoyed on our pool deck or in the dining area. This beautiful enclave offers privacy and stress free relaxation. 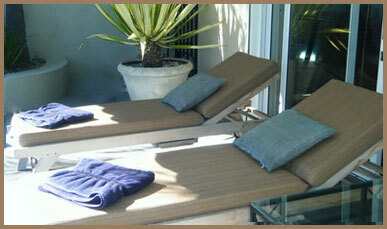 Relax by the swimming pool after another exciting day in Cape Town and enjoy the mountain and sea views.